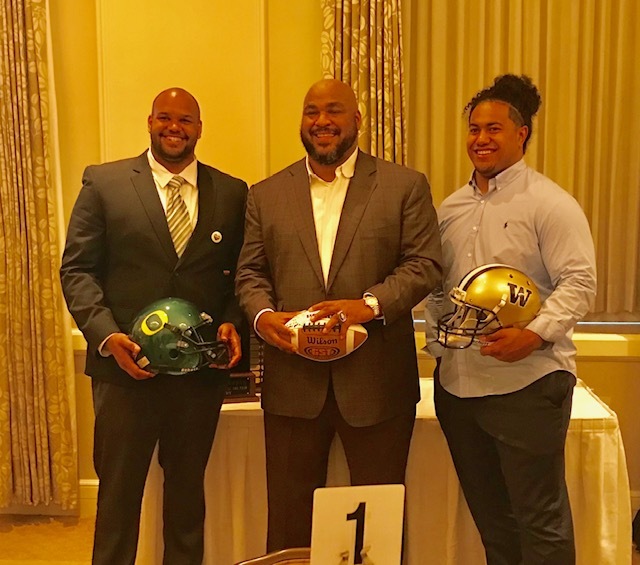 2017 Morris Trophy winners Tyrell Crosby and Vita Vea with Pro Football Hall of Famer Walter Jones. 2016 winners Isaac Asiata (L) and Solomon Thomas with KJR’s Ian Furness (L) and Jason Puckett. The Morris Trophy has been awarded to 68 players since 1980. Every winner of the Morris Trophy has gone on to join a professional football team. 28 Morris Trophy winners were taken in the first round of the NFL draft, including 2017 winner Vita Vea who was taken with the 12th overall pick by the Tampa Bay Buccaneers. Vea is the third University of Washington player to be drafted in the first round after winning the Morris Trophy. 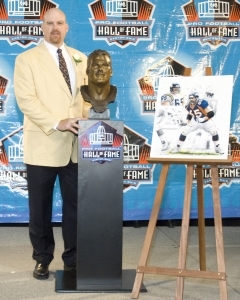 1990-91 winner Steve Emtman was taken first overall in the 91 draft by the Indianapolis Colts and 1991-92 winner Lincoln Kennedy was taken ninth in the 92 draft by the Atlanta Falcons. 2017’s offensive winner, Oregon’s Tyrell Crosby, was selected in the fifth round by the Detroit Lions. 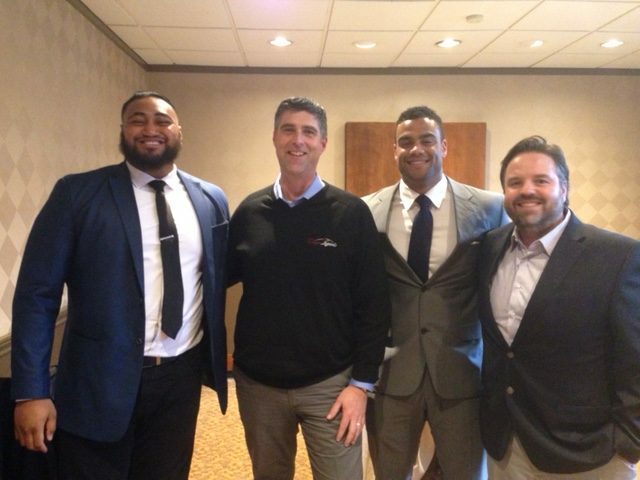 The 2015 winners, Josh Garnett and DeForest Buckner, were both first round picks and both selected by the 49ers. It’s the fourth time Morris Trophy winners have both been taken in the first round of the same draft and the first time they’ve been selected by the same team. appearances in the NFL’s postseason all-star game. 16 Morris Trophy winners have received the highest individual single-season honor you can get in the in the NFL by being named to the All-Pro team. Again, many of these players have been named All-Pro on multiple occasions. As of January 2019, 14 Morris Trophy winners are on NFL rosters. Four Morris Trophy winners have received the ultimate honor from professional football: induction into the Pro Football Hall of Fame in Canton, Ohio. The Morris Trophy was only its third year of existence when Bruce Matthews of USC won the 1982 award. One of the more versatile linemen to ever play the game, Matthews played center, guard, and tackle at USC and then played every line position again during his 19 year NFL career with the Houston Oilers and Tennessee Titans. He was incredibly durable as a pro never once missing a game due to injury. He started 229 consecutive games and played in 296 games as a pro, more than any other lineman in pro football history. He went to an NFL record 14 Pro Bowls and was named to the All-Pro team nine times. He was also named to the NFL’s All-Decade team for the 1990s. He played in Super Bowl XXXIV for the Titans. If you’re ever invited to a Matthews family reunion prepare to meet some football players. Bruce’s dad played for Green Bay in the ’50s, his brother Clay played in the NFL for 19 years, his sons Kevin, Jake, and Mike all play in the NFL as do his nephews Clay and Casey. Mathews was inducted into the Pro Football Hall of Fame in Canton, Ohio, in 2007. The Morris Trophy was just the beginning in terms of awards for 1983 winner Gary Zimmerman from the University of Oregon. The offensive tackle had a 14 year professional career that started with the Los Angeles Express of the USFL. He joined the NFL’s Minnesota Vikings in 1986 and was a Denver Bronco for the last five years of his career before retiring in 1997. He was a seven-time pro bowler, a five-time member of the All-Pro team and he was named to the NFL’s All-Decade team for both the ’80s and the ’90s. He was named one of the 50 Greatest Minnesota Vikings of all time and was also inducted into the Denver Broncos Ring of Honor. He’s also a member of the Oregon Sports Hall of Fame. In his final year as an NFL player he was part of the first Super Bowl winning team in Broncos history. 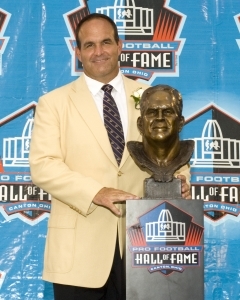 Zimmerman was inducted into the Pro Football Hall of Fame in 2008. Randall McDaniel is one of the most athletic offensive linemen in football history. In high school in Phoenix, Arizona, McDaniel ran a 100 meter dash in 10.64 seconds. He once ran 400 meters in just over 50 seconds. He also participated in the shot put and discus throw. He was a three year starter and all state selection in basketball. But it was football where made his mark in the world. His career as a guard at Arizona State University culminated in the school’s first ever Rose Bowl appearance in 1987. He was drafted by Minnesota in 1988 and had 11 stand out seasons with the Vikings before finishing his career in Tampa Bay. He started 12 consecutive Pro Bowls and was an All Pro for nine consecutive years in the ’90s. He was also a member of the NFL’s All Decade team in the ’90s. He was sometimes used in the backfield in goal line situations and holds the distinction of being the oldest NFL player to catch his first TD pass…a feat he pulled off at the age of 36. He was inducted into the Pro Football Hall of Fame in Canton, Ohio, in 2009. 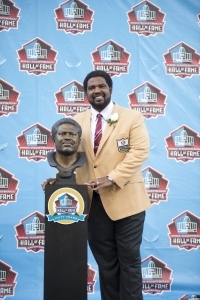 At 6′ 9″ and 345 pounds offensive tackle Jonathan Ogden is the biggest Morris Trophy winner of all time. His terrific career at UCLA ended in 1995 when in addition to the Morris Trophy he was named the Outland Trophy winner, the UPI Lineman of the Year, and an All American. He is a member of the Baltimore Ravens Ring of Honor and was on the Ravens first ever Super Bowl winning team in 2001. He was the first player ever drafted by the Ravens, an 11 time Pro Bowler and made the All Pro team on five occasions. Ogden was named the NFL Offensive Lineman of the Year in 2002 and made the NFL All Decade team for the 2000s. 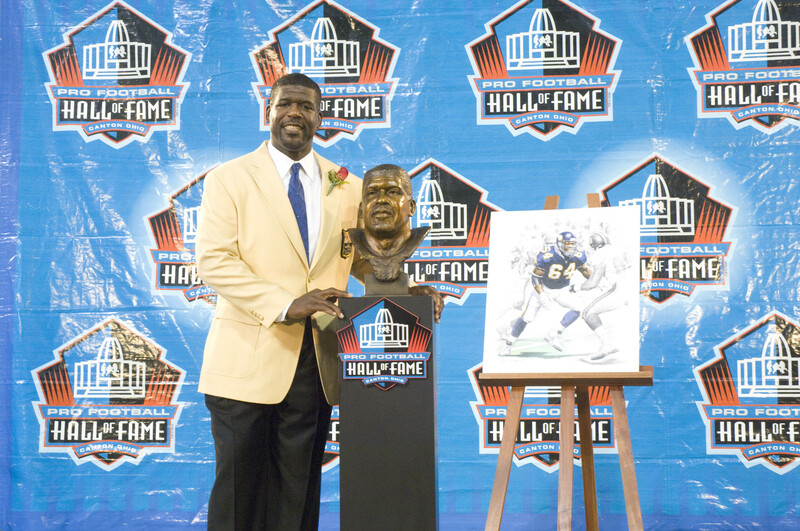 He was inducted into the Pro Football Hall of Fame in 2013.